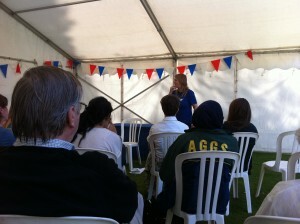 On Saturday I did my 2nd ever public speaking thing, at my 2nd ever festival. Unlike my 1st one (at Latitude festival), this was quite a bit smaller. This meant there was no stage to separate me from the bleeding-eared youngsters I was unloading profanaties upon, no bright lights to dazzle my view of them, no microphone to help spew my stupid nervous voice to the back of the tent… and this time I was doing TWO separate talks in TWO different tents in under TWO hours! He was really good at doing public speaking! As was Saci Lloyd, Gareth P Jones, and, I didn’t get a chance to see her speaking, but judging by the REALLY LOUD reactions from her audience, so was Ellie Irving! I, on the other hand, was expertly fumbly, mumbly, bumbly and forgetful. I babbled blindly about my book, then read incompetently from it. I stumbled foolishly when trying to find the right pages to read from (even though I had clearly labelled page markers! ), and I suffered the tumbleweed silence in response to my ‘Any questions?’ questions. 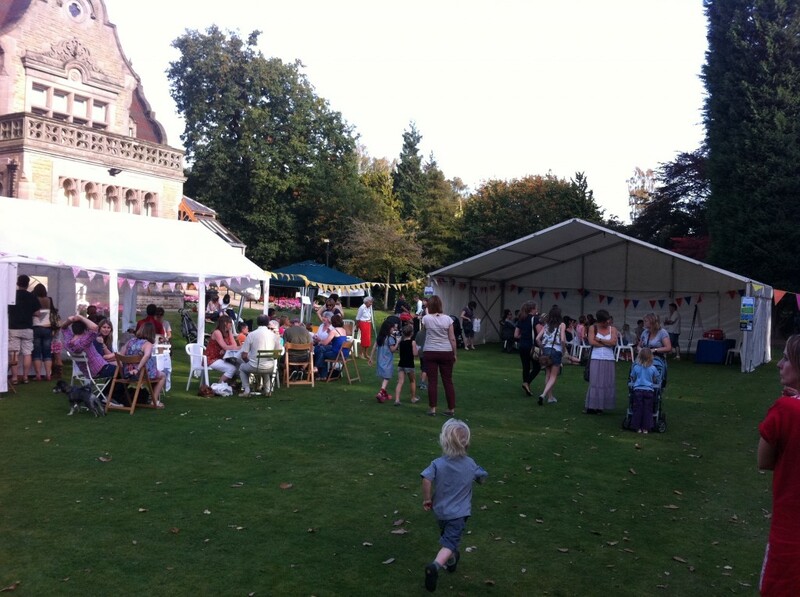 It’s okay, the second I arrived and saw the beautiful village fete style marquees, bunting, and cake stalls, I knew that my nob-ache book would go down like a fart at a funeral, so I prepared myself for stunned silences, angry mobs and outrageous humiliation. Luckily, as usual, I was completely wrong. 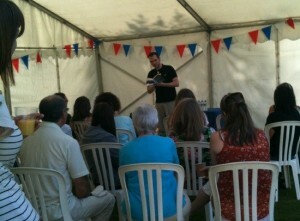 The audiences were amazing – attentive, responsive (not so much at the ‘any questions’ bit), and they even LAUGHED! At the bits they were supposed to! 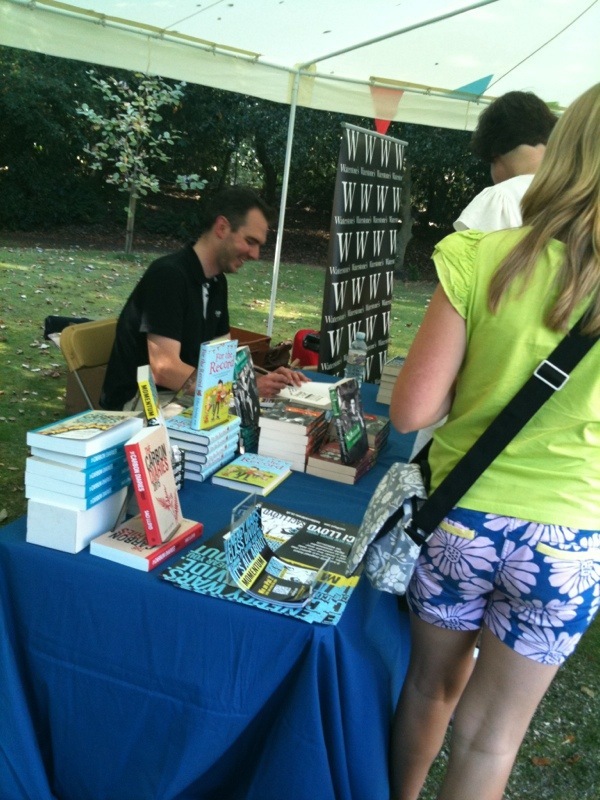 People queued up to get my book signed and then I had my first time priveledge of watching people reading it. It was AMAZING! There were 3 teenage girls all sitting on a grassy bank, all reading my book, and all laughing. I desperately wanted to get a photo of this to share with you, but, unfortunately I think it’s kind of frowned upon for a grown man to start taking pictures of teen girls, so I refrained. So that’s it. No.2. It was nice, it was good, it was enjoyable and I can’t wait to do it again (though I don’t think I’ll ever get any better at doing it). Teehee! It sounds like I’m talking about poo! (But I’m not… much). A queue I tell you! A QUEUE! (Okay, so it's only two people long, but we're not focussing on that). Even your bookmarks go down well at my shop. Two boys (I say “boys” they were aged about 21) left with one each, turning them every angle known to man giggling like buffoons and reading all the quotes. They were clutching those bookmarks like they were JEWELS. If they didnt come back and buy the book though Ill hunt them down and get those bookmarks back. If they didn’t come back, well, at least they enjoyed the bookmarks! Thanks Hannah, I think you are officially my No.1 representative in the land of Scot. event looks great but one problem: IT’S NOT WHERE I LIVE AND THUS I’M NOT THERE!!! Oh, it sounds like you had so much fun! 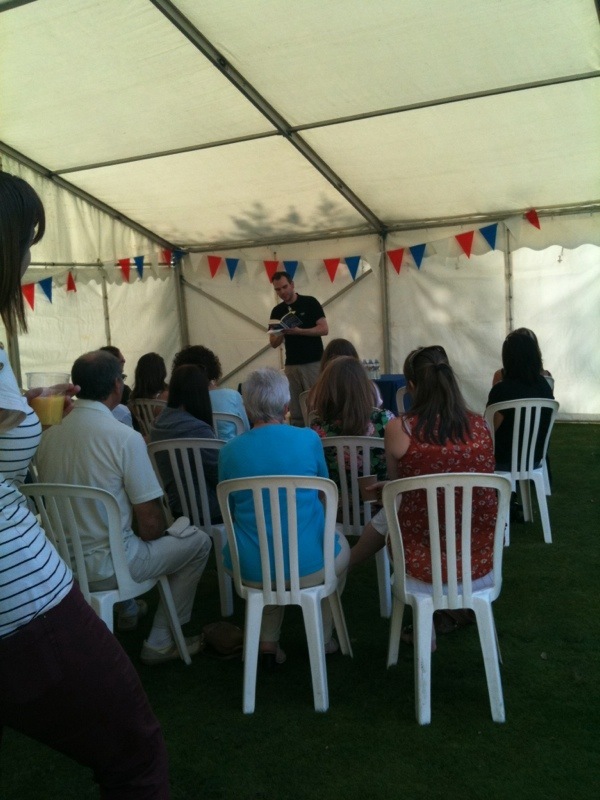 Atom should arrange an event down south and get you down! 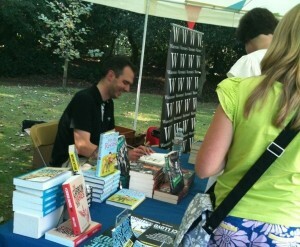 I could say hi, and I could get signed books as pressies!